The Barnstead Nanopure Type I ultrapure water system combines high quality water, precise volume dispensing controls and system monitoring in a flexible, compact design. Value-added features include: Volumetric or timed dispensing, NIST Traceable calibration, TOC monitoring and simple maintenance with automatic sanitization. Four application-specific models – Analytical, UV, UF and Life Science – can be customized with a unique one-connection cartridge pack that best suits your feed water and research needs. *All models are available as Standard Unit or TOC Unit. 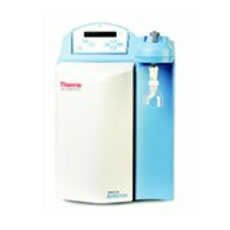 Produce ultra-pure water with the outstanding performance of the Thermo Scientific Barnstead NanoPure system.